Physiotherapy has the ability to provide both physical and emotional benefits that can make a positive difference in a rabbits life. Physiotherapy has the ability to provide both physical and emotional benefits that can make a positive difference in a rabbit's life. 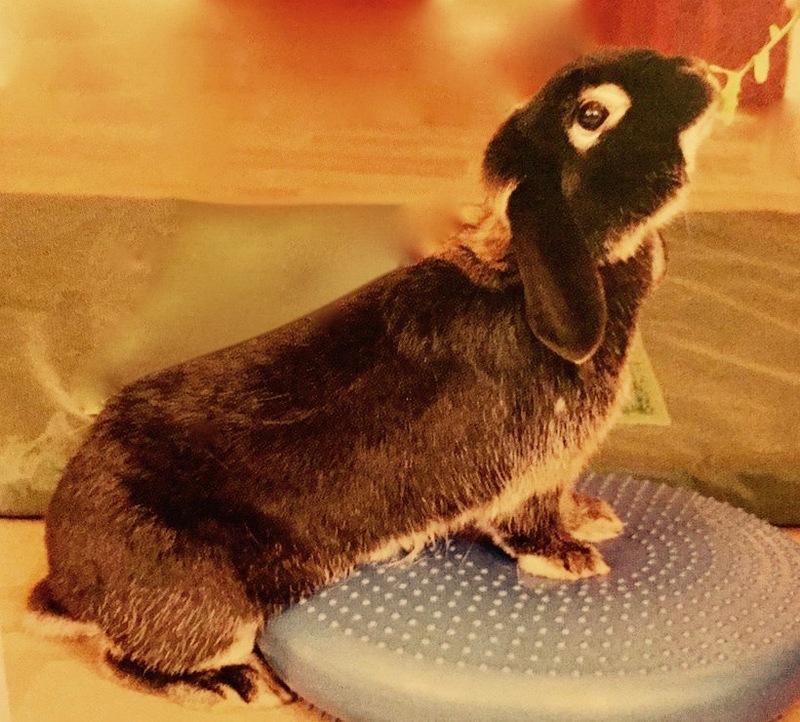 Rabbits can benefit from physiotherapy input after surgery, injury or illness as well as used to maintain a good quality of life for older animals. The aims of physiotherapy are to aid the animals healing capacity by reducing pain and inflammation, improving joint range of motion and muscle strength, therefore restoring movement, function and quality of life. I treat them in their own homes where they are most relaxed. Rabbits suffer from a range of orthopaedic and neurological conditions and therefore can benefit from physiotherapy. Physiotherapy involves the use of strength-building techniques i.e. positioning, exercise, manual therapies, cryotherapy/thermal therapy and electrotherapy. Positioning is a very helpful exercise for hind end “paralysed rabbits” to help re-educate a rabbit to achieve and maintain a normal posture. It can also decrease stiffness, increase joint motion and flexibility, as well as building strength. While the success of physical therapy depends on an individual rabbit’s condition and is by no means a cure-all but I strongly believe it has the potential to be of great benefit to a wide variety of rabbits. It is a legal requirement that anyone treating an animal must have veterinary permission to do so. Where a rabbit shows symptoms which may require veterinary attention (i.e fever, digestive issues or infection. ), it may be necessary to delay treatment until veterinary advice has been sought. Compensatory patterns of movement create muscle imbalance and weakness, shortened soft tissues and altered neural control. Physio assists with increasing and maintaining strength and flexibility, restoring normal movement patterns, regaining lost function and promoting good quality of life. Some rabbits develop arthritis naturally due to age or genetics and it grows to be a disability for them. Other rabbits may develop arthritis due to another condition or injury they have had. It can develop in rabbits that have fractured their spine and lost mobility in their hind legs, rabbits that have splay legs, rabbits that have broken or malformed legs, and rabbits that have had one or more legs amputated. In these rabbits, arthritis commonly develop over timebecause the remaining “healthy” legs have to compensate for the one/ones that are not operating properly. This adds stress to the joints and can lead to arthritis. Most arthritis is not fixable but it can be managed. Massage and other forms of physical therapy can help to exercise and ease tension in the joints and sometimes can help relieve arthritis symptoms.